Electromechanical effects arise due to the interaction between electromagnetic fields and solid, elastic structures or rigid bodies. These interactions may be time invariant, time harmonic, or time varying. The solid objects can experience forces that will lead to deformation or movement. The electrostatic force describes the force between electrical charges that are slow moving or at rest. The electrostatic force leads to attraction between oppositely charged objects and repulsion between objects with the same charge. Microelectromechanical systems (MEMS) exploit electrostatic forces to actuate switches and deform structures. Electrostatic force pulling down an RF MEMS switch. The magnetostatic force refers to the steady-state force that is created in the presence of a magnetic field that can result from a permanent magnet or a constant current flowing through a conductor. A magnetic material (e.g., iron) placed in a magnetic field will experience a magnetostatic force. A permanent magnet exerts force on an iron rod in close proximity. The electromotive force describes the force on a charged particle moving through a magnetic and electric field, or the induced currents and voltages in conductors due to a moving magnet that is nearby. Solenoids, motors, and generators exploit electromotive forces to generate motion or power. 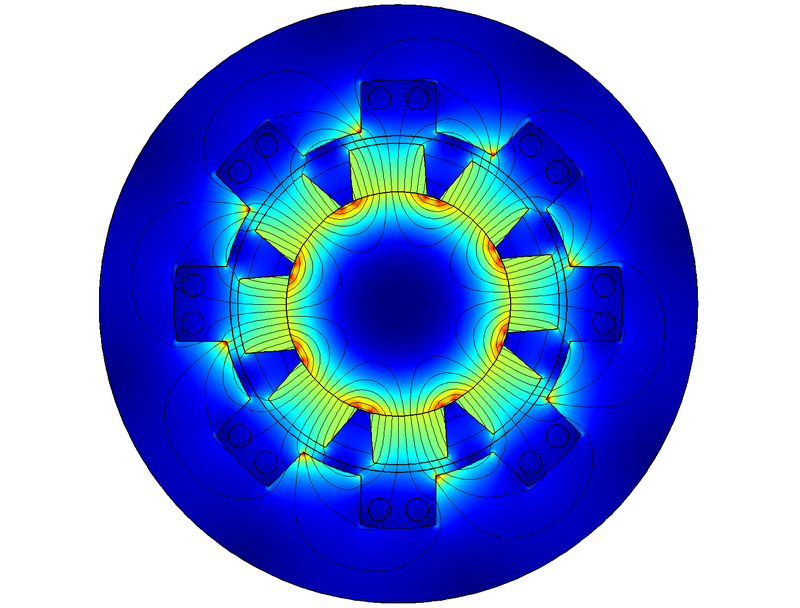 The motion of the rotor comprised of permanent magnets induces a voltage across the coil windings. The radiation pressure refers to the pressure due to the momentum carried by an electromagnetic wave that is transferred to an object interacting with electromagnetic fields. High-power radio-frequency cavities may need to consider the effects of radiation pressure and the deformation of the cavity walls. The piezoelectric effect is a property of certain kinds of dielectrics that causes them to deform due to an applied electric field and to accumulate a charge under deformation. Piezoelectric materials are often used in speakers as well as ultrasound transducers. The piezoresistive effect is a property of certain kinds of conductive materials that causes their electrical resistance to change as a result of an applied mechanical strain. This effect is used for specific types of sensors. Electrostriction refers to the body forces that arise in dielectric materials, causing them to deform due to an applied electric field. Magnetostriction is the analogue of electrostriction. This effect refers to the deformation of ferromagnetic materials as a result of an applied magnetic field.